Select SIZE 2'X30" 3'X30" 4'X30" 5'X30" 6'X30" 7X30" 8X30"
SUITCASE® RAMP Signature Series™ Available in 2' - 8' lengths This ultra-strong, single-fold ramp provides the safety and strength required while remaining lightweight and portable. 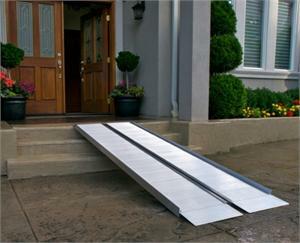 The smooth and quiet action of the living hinge, a continuous full length low profile hinge, adds strength and stability to the ramp. Features an extruded non-skid tread for superior traction, and a self-adjusting bottom transition plate for easy conversion from ramp to ground. Welded construction provides long-term durability and safety. Optional Top Lip Extension (TLE) will increase the reach of the SUITCASE Signature Series ramp by extending the lip from the standard 3" length to 9". The EZ-ACCESS TLE is unique because it can be added or removed as needed. *Weights are approximate and may vary. ** Consult your equipment's owner guide for proper degree of incline. Never exceed its recommendations.